Melioidosis is endemic in South East Asia, Asia and northern Australia. Infection usually follows percutaneous inoculation or inhalation of the causative bacterium, Burkholderia pseudomallei, which is present in soil and surface water in the endemic region. While 20–36% of melioidosis cases have no evident predisposing risk factor, the vast majority of fatal cases have an identified risk factor, the most important of which are diabetes, alcoholism and chronic renal disease. Half of all cases present with pneumonia, but there is great clinical diversity, from localised skin ulcers or abscesses without systemic illness to fulminant septic shock with multiple abscesses in the lungs, liver, spleen and kidneys. 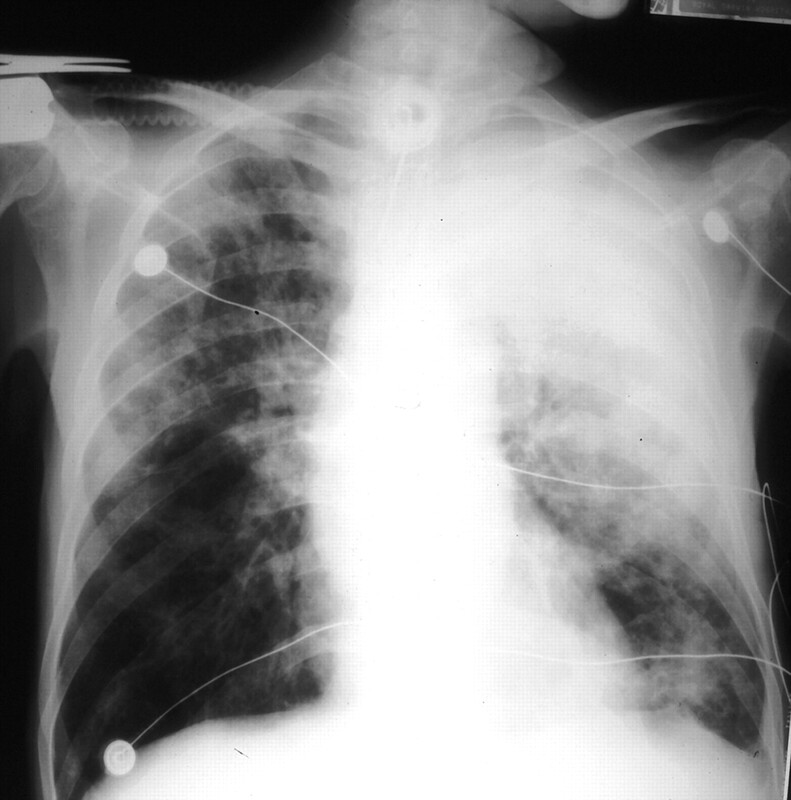 At least 10% of cases present with a chronic respiratory illness (sick >2 months) mimicking tuberculosis and often with upper lobe infiltrates and/or cavities on chest radiography. As with tuberculosis, latency with reactivation decades after infection can also occur, although this is rare. Confirmation of diagnosis is by culture of B. pseudomallei from blood, sputum, throat swab or other samples. Microbiology laboratories need to be informed of the possibility of melioidosis, as those not familiar with it can misidentify the organism. Antibiotic therapy is initial intensive therapy with i.v. ceftazidime or meropenem or imipenem +/− cotrimoxazole for ≥10 days, followed by eradication therapy with cotrimoxazole +/− doxycycline +/− chloramphenicol (first 4 weeks only) for ≥3 months. Melioidosis has been increasingly recognised in returning travellers in Europe and recently melioidosis and colonisation with B. pseudomallei have been documented in cystic fibrosis patients visiting or resident in endemic areas. In Rangoon, Burma, in 1912, Whitmore and Krishnaswami 1 described cases of a newly recognised septicaemic disease. Some fatal cases were morphia addicts and autopsy findings were characterised by widespread caseous consolidation of the lungs, classically with abscesses in the liver, spleen, kidney and subcutaneous tissues. This is the fulminant end of the spectrum of a disease now recognised as a major cause of fatal septicaemia in endemic tropical locations. The Gram-negative bacillus isolated from the lungs and other organs was similar to that causing glanders (Burkholderia mallei), but was motile. Whitmore 2 also noted the clinical resemblence to glanders. The disease was named melioidosis by Stanton and Fletcher 3, based on a derivation of the Greek melis (distemper of asses). After various earlier names, the causative bacterium was called Pseudomonas pseudomallei 4. Due to 16s ribosomal ribonucleic acid sequences, deoxyribonucleic acid (DNA)‐DNA homology values, the cellular lipid and fatty acid composition, and phenotypic characteristics within the Pseudomonas genus, seven species were moved to a new genus, Burkholderia 5, in 1992. The new genus was named after the US microbiologist Walter Burkholder, who, in 1949, first described B. cepacia, formerly P. cepacia, as the plant pathogen causing bacterial rot of onions (“slippery skin”) 6. B. cepacia is the type species in the genus, which includes the organisms causing melioidosis (B. pseudomallei) and glanders (B. mallei). A number of additional related environmental bacterial species have subsequently been discovered and added to the Burkholderia genus. Although originally considered a zoonotic infection from rodents 7, zoonotic infection is actually very rare, with only three possible cases described from Australia 8. It is now clear that humans and animals are infected by exposure to B.pseudomallei present in soil and surface water in endemic locations 9. The interaction of B. cepacia and other species in the Burkholderia genus with environmental elements has relevance for B. pseudomallei 10. B. cepacia strains have an ecological niche in the rhizosphere of plants and there is great interest from the agricultural industry in using B. cepacia as a biological control agent 11. B. cepacia can degrade some toxic compounds in pesticides and herbicides, and can kill many soil-borne plant pathogens. However, rapid mutation and adaptation is considered likely, given the presence of numerous insertion sequences within B. cepacia 11, including, for some strains, sequences identical to B. pseudomallei insertion sequences 12. This justifies concern that widespread agricultural use of B. cepacia may be a hazard to human health and, most particularly, for patients with cystic fibrosis (CF) 11. Recent molecular studies have confirmed, for the first time, that as with B. pseudomallei, human pathogenetic strains of B. cepacia from CF patients can be found in local agricultural soils 13. Following the initial account in Burma, melioidosis was documented in humans and animals in Malaysia and Singapore from 1913 7 and then in Vietnam from 1925 and Indonesia from 1929 14, 15. The majority of cases of melioidosis are from South East Asia and northern Australia. Thailand has reported the greatest numbers 16–18, with an estimated 2,000–3,000 cases of melioidosis each year 19. Melioidosis is also common in Malaysia 20–22 and Singapore 23–28. Other countries in the region where melioidosis is recognised in humans and animals include China (especially Hong Kong), Taiwan and Brunei 15, 29–33. Melioidosis is also likely to occur in Cambodia, Laos and the Philippines 15, 19, 34. Melioidosis has been increasingly recognised in India 29, 35, 36, although reports that some of the “plague” scares of 1994 may have been cases of melioidosis 37 have been disproved 38, 39. Cases have been reported from Sri Lanka, Bangladesh and Pakistan 15, 40. A recent study from southern Vietnam confirmed that melioidosis is present but far less common than in north-east Thailand 41. Cases of melioidosis have also been documented in Papua New Guinea 42 and Fiji, but the extent of endemicity in the Pacific islands remains to be defined. The two locations where melioidosis is arguably the most important single bacterial pathogen for humans are some north-east provinces in Thailand and the top end of the Northern Territory of Australia. In north-east Thailand, 20% of community-acquired septicaemic cases are due to melioidosis, which accounts for 39% of fatal septicaemias 17 and 36% of fatal community-acquired pneumonias 43. At the Royal Darwin Hospital in the Northern Territory, melioidosis is the most common cause of fatal community-acquired bacteraemic pneumonia 44. Within Thailand, melioidosis occurs in other northern provinces and to a lesser extent in the south, and it is also well recognised in other regions in tropical northern Australia, such as northern Queensland 45–47 and the Kimberley region of northern Western Australia 48. Global warming may well result in expansion of the endemic boundaries of melioidosis. In Australia it is predicted that temperature, overall rainfall and rainfall intensities will all increase in northern regions, possibly facilitating a southern extension of melioidosis 49. In addition to endemic melioidosis, there are several documented situations where melioidosis has become established in nontropical locations. In France, in the 1970s, cases of melioidosis occurred in animals in a Paris zoo and then spread to other zoos and equestrian clubs in France 15. As well as fatal animal and human cases, there was extensive soil contamination persisting for some years. B. pseudomallei was considered likely to have been introduced by importation of infected animals, possibly a panda donated to France by Mao‐Tse‐Tung or horses from Iran 15. A cluster of cases occurred over a 25‐yr period in south-west Western Australia (31°S), involving animal cases and one human infection in a farmer 50. Ribotyping of the farm animal and human isolates and one isolate from the soil showed identical patterns 51. This supports the suggestion of clonal introduction of B.pseudomallei into this temperate region, probably via an infected animal, with environmental contamination, local dissemination and persistence over 25 yrs. Melioidosis was an important cause of morbidity and mortality in foreign troops fighting in South East Asia. Dance 15 noted that ≥100 cases occurred among French forces in Indochina between 1948–1954, and by 1973, 343 cases had been reported in American troops fighting in Vietnam 52. Concerns of re-activation of latent infection in soldiers returned from Vietnam, with estimates from serology studies of ∼225,000 potential cases, resulted in melioidosis being called the “Vietnamese time bomb” 53, 54. However, while occasional cases of re-activation of B. pseudomallei still occur in Vietnam veterans 55, 56, it is rare in comparison to the numbers exposed. Melioidosis remains a risk for travellers to endemic areas, especially if they have a recognised risk factor as discussed below. Adventure tours resulting in extensive exposure to wet season soils and surface water are a possible scenario for infection. This occurred in early 2002 in a young French tourist who died from fulminant melioidosis septicemic pneumonia after exposure to muddy soils on a camping tour of a tropical Australian wilderness park. Imported melioidosis cases are seen each year in hospitals in southern Australia 44. Some of these cases are acquired in tourists returning from northern Australia and others are acquired in South East Asia. Occasional imported cases are also reported from Europe and the USA 40, 57, 58. While the vast majority of these cases are from recent acquisition of B. pseudomallei, asoccurs with >90% of cases in northern Australia 59, occasional patients may have chronic melioidosis or have re-activation of disease from a latent focus many years after leaving an endemic area, as noted above in returned soldiers from Vietnam. With increasing movement of people between countries and with expanding live animal exports from endemic regions such as northern Australia, emergence of new foci of melioidosis may well occur in addition to the diagnosis of imported cases in hospitals around the world in people returning from or travelling in endemic regions. In most endemic regions there is a close association between rainfall and melioidosis. In north-east Thailand 60 and northern Australia 61, 75 and 85% of cases, respectively, occur in the wet season. Although the earliest animal studies had shown infection with B. pseudomallei through oral or nasal exposure and from ingestion, recent reviews consider that the majority of human cases are from percutaneous inoculation of B. pseudomallei following exposure to muddy soils or surface water in endemic locations 4, 14, 44. Ingestion 44 and sexual transmission 62 have been suggested as unusual modes of transmission of B. pseudomallei. Presentations with melioidosis pneumonia following presumptive inoculating skin injuries have been documented in patients with soil-contaminated burns 63 and are common in tropical Australia 44, 61. An animal model has also shown spread of B. pseudomallei to the lungs following burn inoculation 63. This suggests haematogenous spread to the lung rather than inhalation or spread from the upper respiratory tract. This is analogous to post-primary tuberculosis, with disease from haematogenous spread localising in the upper lung zones. Support for this comes from the observation that septicaemic melioidosis pneumonia cases are often more systemically ill than suggested by initial chest radiography 44. However, it is likely that under certain epidemiological conditions inhalation is the main mode of infection. This was suggested for soldiers exposed to dusts raised by helicopter rotor blades in Vietnam 64. Melioidosis following near drowning is well documented, with the probable infecting event being aspiration 31, 65, 66. Recently, it has been shown that intensity of rainfall is an independent predictor of melioidosis presenting as pneumonia and of a fatal outcome (B.J. Currie, unpublished data). It was postulated that this might be explained by heavy monsoon rainfall and winds resulting in a shift towards inhalation as the mode of infection with B. pseudomallei. The occurrence of a more fulminant disease with a high mortality when inhalation is the mode of infection rather than percutaneous inoculation is analogous to inhalational anthrax and plague 67, 68. Serology studies indicate that most infection with B.pseudomallei is asymptomatic 45, 69–71. In north-east Thailand, a majority of the rural population is seropositive by indirect haemagglutination (IHA) 60, with most seroconversion occurring between 6 months and 4 yrs of age 71. Although melioidosis occurs in all age groups, severe clinical disease, such as septicaemic pneumonia, is seen mostly in those with risk factors such as diabetes, renal disease and alcoholism 4, 46, 60, 61. In addition to infection by inhalation, bacterial load on exposure (inoculating dose) and virulence of the infecting strain of B. pseudomallei are also likely to influence severity of disease. However, it has been noted that, despite the large bacterial load in severely ill patients with septicaemic pulmonary melioidosis, person-to-person transmission is extremely unusual 9, 72. This, together with the rarity of fulminant melioidosis in healthy people, supports the primary importance of host risk factors for the development of melioidosis. To date there is no definitive evidence for development ofimmunity from melioidosis with natural exposure to B.pseudomallei and re-infection has occurred with a different strain of B. pseudomallei following successful treatment of melioidosis 73, 74. The incubation period for melioidosis is likely to be influenced by inoculating dose, mode of infection, host risk factors and differential virulence of infecting B. pseudomallei isolates 64, 75. Rapid onset of melioidosis (even within 24 h of inoculation) has been seen in presumed aspiration following near drowning 31, 65, as well as in a small number of patients with heavy environmental exposure 59. In 25 cases where a clear incubation period could be determined between the inoculating injury and the onset of symptoms, the incubation period was 1–21 days (mean 9 days) 59. This is consistent with a series of nosocomial melioidosis cases from Thailand, where the incubation period was 3–16 days (mean 9.5 days) 76. Melioidosis presentations can be acute or chronic disease 59. Chronic disease is defined as illness with symptoms for >2 months duration on presentation. Of 252 cases of culture-confirmed melioidosis, 222 (88%) presented with acute illness and 30 (12%) with chronic illness, with no fatalities in the latter group 59. It has long been recognised that, analogous to tuberculosis, B. pseudomallei has the potential for re-activation, hence, the concern of the Vietnamese time bomb in returned soldiers (see above). Latent periods from exposure to B. pseudomallei in an endemic region to onset of melioidosis in a nonendemic region have been documented to be as long as 29 yrs 56. However, documented cases of re-activated B. pseudomallei are very uncommon. The small numbers of such cases in the USA in comparison to the estimated 225,000 seropositive soldiers who returned from Vietnam 53, 54, suggest re-activation of B. pseudomallei is an infrequent event. Most cases of melioidosis in endemic areas are recent infections presenting with acute illness 15, 17, 44–46. In the Darwin study, only 3% (8 out of 252) of cases were considered to be re-activation of B. pseudomallei from a latent focus 59. Most cases of re-activation present as pulmonary melioidosis. This is consistent with the latent focus usually being in the lungs, with B. pseudomallei probably dormant within pulmonary macrophages or other cells. Re-activation of melioidosis has been associated with influenza 55, other bacterial sepsis 77 and development of known melioidosis risk factors such as diabetes. It remains unknown what proportion of asymptomatic seropositive people actually have latent infection with the potential for re-activation. There has been a resurgence of interest in B. pseudomallei and melioidosis pathogenesis in the last decade. Concerns of possible bio-terrorism using the bacteria or its virulence components in genetically engineered constructs 78 and of exposure of military personnel to B. pseudomallei have driven funding for recent work. There are excellent reviews of recent developments and the search for virulence factors and potential vaccines 79–83. While it is clear from laboratory studies of isolates of B.pseudomallei from animals, humans and the environment that there is differing virulence amongst B. pseudomallei isolates 84–86, the importance of this variation in virulence in determining clinical aspects of melioidosis remains uncertain. Molecular typing showing clonality of isolates in animal and human clusters in Australia has revealed that the same outbreak strain can cause different clinical presentations, with host factors being most important in determining the severity of disease 8, 44, 87. Furthermore, molecular studies both within and between endemic regions are required to ascertain if clinically significant strain variation occurs, both in relation to virulence and tissue or organ specificity. There are important host protective mechanisms against B.pseudomallei in cytokine responses, as well as potentially detrimental ones 88, 89. However, the predominant association with fatal melioidosis is the presence of defined patient risk factors 44, 61. The most important risk factors for melioidosis are diabetes, alcohol excess and renal disease, as summarised in table 1⇓ 4, 16, 17, 46, 60, 61, 90, 91. In the Darwin study, 51 out of 252 cases (20%) had no identified risk factor and there was only one fatality in this group 61, confirming that severe disease and fatalities are uncommon in those without risk factors. Risk factors are less commonly present in children than in adults 92–95. The current author has previously suggested that the predisposition to melioidosis in diabetics, cases of alcohol excess and those with chronic renal disease may reflect their impaired polymorphonuclear leukocyte (PMNL) functions, such as mobilisation, delivery, adherence and ingestion 61. There has been recent support for the role of PMNL in initial host containment of infections with other fast-replicating intracellular bacteria such as Listeria monocytogenes, Salmonella typhimurium and Mycobacterium fortuitum 96. Melioidosis has also been described in chronic granulomatous disease 97. The possible primary role of PMNL function in containing B. pseudomallei led to empirical use of granulocyte colony-stimulating factor (G‐CSF) in patients with strictly defined septic shock in the intensive care unit at Royal Darwin Hospital. Uncontrolled data show a significant improvement in survival with G‐CSF (see below) 61, 98. The earliest descriptions of melioidosis documented the fulminant end of the clinical spectrum, with abscesses throughout both lungs and in many organs 1, 2. At the other end of the spectrum are asymptomatic infections and localised skin ulcers or abscesses without systemic illness. Inoculating dose of B. pseudomallei, mode of transmission, virulence of the infecting bacterial strain, and host predisposition and underlying risk factors will all influence the clinical presentation and outcome. Howe et al. 64 classified melioidosis as acute, subacute and chronic, while the Darwin study separated acute and chronic disease 59. In the Darwin study, 46% of cases were bacteraemic and overall mortality was 19% 61, compared with 60% bacteraemia and 44% mortality in Thailand 60, and 52% bacteraemia and 46% mortality in Singapore 27. Pneumonia is the commonest clinical presentation of melioidosis in all studies with around half of all melioidosis patients presenting with pneumonia 4, 14, 16, 17, 21, 27, 46, 61, 64, 99. The proportion with pneumonia is much higher inthose with chronic disease and those presenting after reactivation from a latent focus. In the Darwin prospective study, pneumonia was the primary diagnosis in 127 out of 252 cases (50%) and an additional 21 cases (8%) developed pneumonia after another primary diagnosis 61. Acute melioidosis pneumonia has a spectrum from fulminant septic shock (mortality 84% in the Darwin study) to mild undifferentiated pneumonia, which can be acute or subacute in nature, both with little mortality. Septicaemic patients present as acutely unwell with high fevers and prostration andoften little initial cough or pleuritic pain 17, 63. There may also be multiple abscesses in abdominal organs. On chestradiography they often have diffuse nodular infiltrates throughout both lungs, which coalesce, cavitate and progress rapidly, consistent with the caseous necrosis andmultiple metastatic abscess formation seen at autopsy 63, 100, 101. However, some septicaemic pneumonia patients have a more predominant cough with productive sputum, dyspnoea and chest radiography showing discrete but progressive consolidation in one or more lobes (fig. 1⇓) 100–102. Acute pneumonia with upper lobe consolidation in endemic regions warrants consideration of melioidosis (fig. 2⇓). While such upper lobe disease has predominated in some reports 101, 102, lower lobe infiltrates were more common overall in non-septicaemic acute and subacute melioidosis from one study 100. 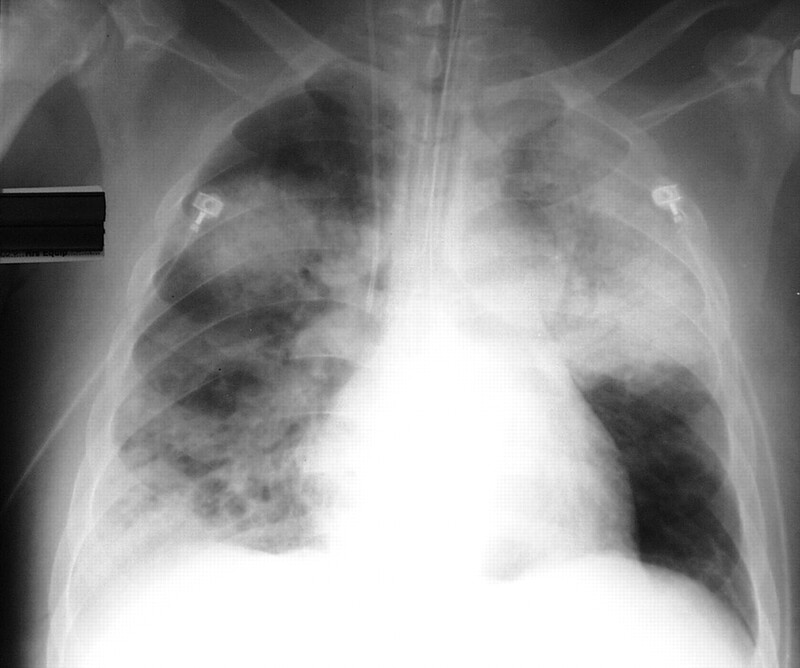 Pleural effusions have generally been uncommon in acute melioidosis 102, but effusions and empyema can still occur, especially with lower lobe disease 100, 101. Patients with chronic pulmonary melioidosis have fevers, weight loss and a productive cough, sometimes with haemoptysis 102, 103. Pleuritic chest pain occurs in half 103. Disease is often slowly progressive over months (fig. 3⇓). It can also be remitting and relapsing over many years, but acute deterioration with septicaemia may also occur. Classically upper lobe changes with infiltrates and/or cavitation are seen on chest radiography, being present in 37 out of 39 (95%) chronic cases in one study 103. Initial chest radiography showed cavitary disease with or without infiltrates in 27 out of 39 (69%) and infiltrates in 12 out of 39 (31%) 103. Pleural effusions were present in two out of 39, hilar adenopathy in only one out of 39 and only three out of 39 had bilateral disease. The cavities are usually single and thin walled and rarely contain an air-fluid level 102–104. Computed tomography (CT) scan may show small cavities not evident on chest radiography 104. There are numerous reports of chronic melioidosis being initially misdiagnosed as tuberculosis. Re-activation of melioidosis from a latent focus can present as fulminant or less severe melioidosis, with chest radiography changes as in the range of acute disease described above 63. Chest radiography before re-activation may be normal or may show focal changes from within which reactivation occurs 59. An important recent observation is that B. pseudomallei canboth colonise lungs and cause disease in patients with CF. There have been at least three cases of melioidosis in CF patients returning to Europe from a melioidosis-endemic region 40, 57, 58. The similarity to infection with B. cepacia in CF is of concern, given the association of B. cepacia with more rapid deterioration in lung function 13, 105. Most recently, in a series of four patients with CF infected innorthern Australia, there was suggested transmission of B. pseudomallei between two affected siblings 106. Person-to-person transmission of B. pseudomallei is very unusual andthis, together with the prolonged carriage time of B.pseudomallei seen in some of the CF cases, parallels the specific predilection seen for B. cepacia. Patients with CF travelling to melioidosis-endemic locations should be warned of the risk of melioidosis and this should be considered if they become sick after returning. A summary of other presentations of melioidosis is given in table 2⇓. Definitive diagnosis of melioidosis requires a positive culture of B. pseudomallei. Melioidosis must be considered in febrile patients in or returning from endemic regions toenable appropriate samples and laboratory awareness. B.pseudomallei readily grows in commercially available blood culture media but it is not unusual for laboratories in nonendemic locations to misidentify the bacteria. Culture from nonsterile sites can be problematic and the likelihood of successful culture is increased if sputum, throat swabs, ulcer/skin lesion swabs and rectal swabs are placed into Ashdown's medium, a gentamicin-containing liquid transport broth that results in selective growth of B. pseudomallei 107. Identification of B. pseudomallei can be made by combining the commercial API 20NE or 20E biochemical kit with a simple screening system involving Gram stain, the oxidase reaction, typical growth characteristics and resistance to certain antibiotics 108, 109. Some commercial identification systems are poor at identifying B. pseudomallei 110. Any confirmed culture of B. pseudomallei should be considered to represent active infection, although the rare possibility of sputum colonisation in people with chronic lung disease such as CF has recently been noted 59, 106. There are a variety of antigen- and DNA‐detection techniques used in endemic regions but these are not yet commercially available 109, 111, 112. IHA and other serological assays are available. In endemic areas their usefulness is limited by high rates of background antibody positivity 60, 112. In acute septicemic melioidosis, IHA is often initially negative, but repeat testing may show seroconversion. A positive IHA in a tourist returning from a melioidosis-endemic region is useful in supporting the possibility of melioidosis, but definitive diagnosis still requires a positive culture. B. pseudomallei is characteristically resistant to penicillin, ampicillin, first and second generation cephalosporins, gentamicin, tobramycin, and streptomycin 4, 113, 114. Before 1989, “conventional therapy” for melioidosis consisted of a combination of chloramphenicol, trimethoprim/ sulfamethoxazole (cotrimoxazole), doxycycline and sometimes kanamycin, given for 6 weeks–6 months 4, 115. Studies subsequently showed B. pseudomallei to be susceptible to various newer β‐lactam antibiotics, especially ceftazidime, imipenem, piperacillin, amoxycillin/clavulanate, ceftriaxone and cefotaxime 116–122. Unlike with “conventional antibiotics”, most studies suggested these newer β‐lactam antibiotics to be bactericidal for B. pseudomallei 118, 120. The most important therapeutic study for melioidosis was an open-label randomised trial in Thailand comparing ceftazidime (120 mg·kg−1·day−1) with “conventional therapy”, which showed that ceftazidime was associated with a 50% lower overall mortality in severe melioidosis 115. Ceftazidime then became the drug of choice for initial intensive therapy for melioidosis. Another study from Thailand showed similar results when ceftazidime was used in combination with cotrimoxazole for initial intensive therapy 123. Whether cotrimoxazole added to ceftazidime is superior to ceftazidime alone is currently being studied in Thailand. The carbapenems, imipenem and meropenem, have the lowest minimum inhibitory concentrations against B. pseudomallei 118–122, 124. Most recently, high-dose imipenem has been shown in another comparative trial from Thailand to be at least as effective as ceftazidime for severe melioidosis, with no differences in mortality between the groups and fewer treatment failures in those given imipenem 99. In patients with septic shock, preliminary data suggest addition of G‐CSF in addition to state-of-the-art intensive care management may increase survival 61, 98. The duration of initial intensive therapy should be ≥10 days 114, with the Darwin study guidelines stating at least 14 days, with a longer time period required if critically ill, or for extensive pulmonary disease, deep seated collections or organ abscesses, osteomyelitis, and septic arthritis and neurological melioidosis 61, 125. Ceftazidime infusions (6g over 24 h, adult dose) through a peripherally inserted central catheter (PICC line) using an elastomeric infusion device (Baxter, Sydney, Australia) in home therapy have enabled early discharge from hospital 61. The absence of any post-antibiotic effect with ceftazidime allows such a continuous infusion, a theoretical advantage over intermittent dosing 126. Following initial intensive therapy, using ceftazidime, imipenem or meropenem, possibly in combination with cotrimoxazole, subsequent eradication therapy is considered necessary for preventing re-crudescence or later relapse of melioidosis. Both duration of eradication therapy and the best antibiotics to use remain unclear. Molecular typing of isolates from recurrent melioidosis has confirmed that by far the majority are true relapses from failed eradication, rather than new infection 59, 73, 74, 127, 128. The most important recent trial of eradication therapy was a comparison of doxycycline alone (the most commonly used eradication regimen in the Darwin study until 1998) versus “conventional” chloramphenicol (first 4 weeks only), cotrimoxazole and doxycycline in combination 129. Relapses were significantly commoner in the doxycycline alone group, resulting in a recommendation that doxycycline should not be used alone as a first-line eradication therapy 129. Similar failures of doxycycline alone as eradication therapy were noted in the Darwin study 59, with some Burkholderia pseudomallei relapse isolates showing acquired doxycycline resistance 130. Since changing to eradication therapy with cotrimoxazole alone in the Darwin study, relapses have been almost exclusively in noncompliant patients 61, consistent with the hypothesis that it is cotrimoxazole which is the critical component in the “conventional” combination therapy. Current trials in Thailand will hopefully ascertain whether it is still beneficial to have combination therapy for the eradication phase of melioidosis treatment or whether cotrimoxazole alone is adequate. See table 3⇓ for Summary of therapy for melioidosis. ↵Previous articles in this series: No. 1: Tärnvik A, Berglund L. Tularaemia. Eur Respir J 2003; 21: 361–373. No. 2: Mabeza GF, Macfarlane J. Pulmonary actinomycosis. Eur Respir J 2003; 21: 545–551. No. 3: Marrie TJ. Coxiella burnetii pneumonia. Eur Respir J 2003; 21: 713–719. No. 4: Mohsen AH, McKendrick M. Varicella pneumonia in adults. Eur Respir J 2003; 21: 886–891. No 5: Morar R, Feldman C. Pulmonary echinococcosis. Eur Respir J 2003; 21: 1069–1077. Whitmore A, Krishnaswami CS. An account of the discovery of a hitherto underscribed infective disease occurring among the population of Rangoon. Indian Medical Gazette 1912;47:262–267. Whitmore A. An account of a glanders-like disease occurring in Rangoon. J Hyg 1913;13:1–34. Stanton AT, Fletcher W. Melioidosis, a new disease of the tropics. Trans Fourth Congr Far East Assoc Trop Med 1921;2:196–198. Leelarasamee A, Bovornkitti S. Melioidosis: review and update. Rev Infect Dis 1989;11:413–425. Yabuuchi E, Kosako Y, Oyaizu H, et al. Proposal of Burkholderia gen. nov. and transfer of seven species of the genus Pseudomonas homology group II to the new genus, with the type species Burkholderia cepacia (Palleroni and Holmes 1981) comb. nov. Microbiol Immunol 1992;36:1251–1275. Burkholder W. Sour skin, a bacterial rot of onion bulbs. Phytopathology 1950;40:115–118. Stanton AT, Fletcher W.. Melioidosis. Studies from the Institute for Medical Research, Federated Malay States. Vol. 21London, John Bale and Danielson Ltd, 1932. Low Choy J, Mayo M, Janmaat A, Currie BJ. Animal melioidosis in Australia. Acta Tropica 2000;74:153–158. Dance DA. Ecology of Burkholderia pseudomallei and the interactions between environmental Burkholderia spp. and human-animal hosts. Acta Trop 2000;74:159–168. Gillis M, Van TV, Bardin R, et al. Polyphasic taxonomy inthe genus Burkholderia leading to an emended description of the genus and proposition of Burkholderia vietnamensis sp.nov. for N2‐fixing isolates from rice in Vietnam. Int J Systematic Bacteriol 1995;45:274–289. Holmes A, Govan J, Goldstein R. Agricultural use of Burkholderia (Pseudomonas) cepacia: a threat to human health?. Emerg Infect Dis 1998;4:221–227. Mack K, Titball RW. The detection of insertion sequences within the human pathogen Burkholderia pseudomallei which have been identified previously in Burkholderia cepacia. FEMS Microbiol Lett 1998;162:69–74. LiPuma JJ, Spilker T, Coenye T, Gonzalez CF. An epidemic Burkholderia cepacia complex strain identified in soil. Lancet 2002;359:2002–2003. Dance DAB. Melioidosis. Reviews Med Microbiol 1990;1:143–150. Dance DA. Melioidosis: the tip of the iceberg?. Clin Microbiol Rev 1991;4:52–60. Punyagupta S.. Melioidosis. Review of 686 cases and presentation of a new clinical classificationIn: Punyagupta S, Sirisanthana T, Stapatayavong B, editors. MelioidosisBangkok, Bangkok Medical Publisher, 1989; pp. 217–229. Chaowagul W, White NJ, Dance DA, et al. Melioidosis: a major cause of community-acquired septicemia in northeastern Thailand. J Infect Dis 1989;159:890–899. Vuddhakul V, Tharavichitkul P, Na‐Ngam N, et al. Epidemiology of Burkholderia pseudomallei in Thailand. Am J Trop Med Hyg 1999;60:458–461. Leelarasamee A. Melioidosis in Southeast Asia. Acta Trop 2000;74:129–132. Puthucheary SD, Lin HP, Yap PK. Acute septicaemic melioidosis: a report of seven cases. Trop Geogr Med 1981;33:19–22. Puthucheary SD, Parasakthi N, Lee MK. Septicaemic melioidosis: a review of 50 cases from Malaysia. Trans R Soc Trop Med Hyg 1992;86:683–685. Vadivelu J, Puthucheary SD, Mifsud A, Draser BS, Dance DAB, Pitt TL. Ribotyping and DNA macrorestriction analysis of isolates of Burkholderia pseudomallei from cases of melioidosis in Malaysia. Trans R Soc Trop Med Hyg 1997;91:358–360. Chan KW, Jayaratnam FJ, Teo SK. Acute septicaemic melioidosis. A report of three fatal cases. Singapore Med J 1985;26:382–385. Tan AL, Ang BS, Ong YY. Melioidosis: epidemiology and antibiogram of cases in Singapore. Singapore Med J 1990;31:335–337. Yap EH, Chan YC, Goh KT, et al. Sudden unexplained death syndrome ‐ a new manifestation in melioidosis?. Epidemiol Infect 1991;107:577–584. Yap EH, Thong TW, Tan AL, et al. Comparison of Pseudomonas pseudomallei from humans, animals, soil and water by restriction endonuclease analysis. Singapore Med J 1995;36:60–62. Singapore Committee on Epidemic Diseases. Melioidosis in Singapore. Epidemiological News Bulletin 1995;21:69–72. Lim MK, Tan EH, Soh CS. Burkholderia pseudomallei infection in the Singapore armed forces from 1987 to 1994 – an epidemiological review. Ann Acad Med Singapore 1997;26:13–17. Dance DA. Melioidosis as an emerging global problem. ActaTrop 2000;74:115–119. Li L, Lu Z, Han O. Epidemiology of melioidosis in China. China J Epidemiol 1994;15:292–295. Lee N, Wu JL, Lee CH, Tsai WC. Pseudomonas pseudomallei infection from drowning: the first reported case in Taiwan. J Clin Microbiol 1985;22:352–354. Lee SS, Liu YC, Chen YS, et al. Melioidosis: two indigenous cases in Taiwan. J Formos Med Assoc 1996;95:562–566. Hsueh PR, Teng LJ, Lee LN, et al. Melioidosis: an emerging infection in Taiwan?. Emerg Infect Dis 2001;7:428–433. Dance DA, King C, Aucken H, Knott CD, West PG, Pitt TL. An outbreak of melioidosis in imported primates in Britain. Vet Rec 1992;130:525–529. John TJ, Jesudason MV, Lalitha MK, et al. Melioidosis in India: the tip of the iceberg?. Indian J Med Res 1996;103:62–65. Cherian T, John TJ, Ramakrishna B, Lalitha MK, Raghupathy P. Disseminated melioidosis. Indian Pediatr 1996;33:403–405. Bharadwaj R, Kagal A, Deshpandey SK, et al. Outbreak of plague-like illness caused by Pseudomonas pseudomallei in Maharashtra, India. Lancet 1994;344:1574. Cherian T, Raghupathy P, John TJ. Plague in India. Lancet 1995;345:258–259. Dance DA, Sanders D, Pitt TL, Speller DC. Burkholderia pseudomallei and Indian plague-like illness. Lancet 1995;346:904–905. Dance DA, Smith MD, Aucken HM, Pitt TL. Imported melioidosis in England and Wales. Lancet 1999;353:208. Parry CM, Wuthiekanun V, Hoa NT, et al. Melioidosis in Southern Vietnam: clinical surveillance and environmental sampling. Clin Infect Dis 1999;29:1323–1326. Currie B. Melioidosis in Papua New Guinea: is it less common than in tropical Australia?. Trans R Soc Trop Med Hyg 1993;87:417. Boonsawat W, Boonma P, Tangdajahiran T, Paupermpoonsiri S, Wongpratoom W, Romphryk A. Community-acquired pneumonia in adults at Srinagarind Hospital. J Med Assoc Thai 1990;73:345–352. Currie BJ, Fisher DA, Howard DM, et al. The epidemiology of melioidosis in Australia and Papua New Guinea. Acta Trop 2000;74:121–127. Ashdown LR, Guard RW. The prevalence of human melioidosis in Northern Queensland. Am J Trop Med Hyg 1984;33:474–478. Guard RW, Khafagi FA, Brigden MC, Ashdown LR. Melioidosis in Far North Queensland. A clinical and epidemiological review of twenty cases. Am J Trop Med Hyg 1984;33:467–473. Faa AG, Holt PJ. Melioidosis in the Torres Strait Islands of Far North Queensland. Commun Dis Intell 2002;26:279–283. Inglis TJ, Garrow SC, Henderson M, et al. Burkholderia pseudomallei traced to water treatment plant in Australia. Emerg Infect Dis 2000;6:56–59. Currie B. Medicine in tropical Australia. Med J Aust 1993;158:609–615. Golledge CL, Chin WS, Tribe AE, Condon RJ, Ashdown LR. A case of human melioidosis originating in south-west Western Australia. Med J Aust 1992;157:332–334. Currie B, Smith Vaughan H, Golledge C, Buller N, Sriprakash KS, Kemp DJ. Pseudomonas pseudomallei isolates collected over 25 years from a non-tropical endemic focus show clonality on the basis of ribotyping. Epidemiol Infect 1994;113:307–312. Rubin HL, Alexander AD, Yager RH. Melioidosis – a military problem?. Mil Med 1963;128:538–542. Spotnitz M. Disease may be Vietnamese time bomb. Medical World News 1966;7:55. Clayton AJ, Lisella RS, Martin DG. Melioidosis: a serological survey in military personnel. Mil Med 1973;138:24–26. Mackowiak PA, Smith JW. Septicemic melioidosis. Occurrence following acute influenza six years after exposure in Vietnam. JAMA 1978;240:764–766. Chodimella U, Hoppes WL, Whalen S, Ognibene AJ, Rutecki GW. Septicemia and suppuration in a Vietnam veteran. Hosp Pract 1997;32:219–221. Schulin T, Steinmetz I. Chronic melioidosis in a patient with cystic fibrosis. J Clin Microbiol 2001;39:1676–1677. Visca P, Cazzola G, Petrucca A, Braggion C. Travel-associated Burkholderia pseudomallei infection (Melioidosis) in a patient with cystic fibrosis: a case report. Clin Infect Dis 2001;32:E15–E16. Currie BJ, Fisher DA, Anstey NM, Jacups SP. Melioidosis: acute and chronic disease, relapse and re-activation. Trans R Soc Trop Med Hyg 2000;94:301–304. Suputtamongkol Y, Hall AJ, Dance DA, et al. The epidemiology of melioidosis in Ubon Ratchatani, northeast Thailand. Int J Epidemiol 1994;23:1082–1090. Currie BJ, Fisher DA, Howard DM, Burrow JN, et al. Endemic melioidosis in tropical northern Australia: a 10‐year prospective study and review of the literature. Clin Infect Dis 2000;31:981–986. Webling DD. Genito-urinary infections with Pseudomonas pseudomallei in Australian Aboriginals. Trans R Soc Trop Med Hyg 1980;74:138–139. Flemma RJ, DiVincenti FC, Dotin LN, Pruitt BAJ. Pulmonary melioidosis; a diagnostic dilemma and increasing threat. Ann Thorac Surg 1969;7:491–499. Howe C, Sampath A, Spotnitz M. The pseudomallei group: areview. J Infect Dis 1971;124:598–606. Achana V, Silpapojakul K, Thininta W, Kalnaowakul S. Acute Pseudomonas pseudomallei pneumonia and septicemia following aspiration of contaminated water: a case report. Southeast Asian J Trop Med Pub Health 1985;16:500–504. Pruekprasert P, Jitsurong S. Case report: septicemic melioidosis following near drowning. Southeast Asian J Trop Med Pub Health 1991;22:276–278. Inglesby TV, O'Toole T, Henderson DA, et al. Anthrax as a biological weapon, 2002: updated recommendations for management. JAMA 2002;287:2236–2252. Inglesby TV, Dennis DT, Henderson DA, et al. Plague as a biological weapon: medical and public health management. Working Group on Civilian Biodefense. JAMA 2000;283:2281–2290. Nigg C. Serologic studies on subclinical melioidosis. J Immunol 1963;91:18–28. Strauss JM, Alexander AD, Rapmund G, Gan E, Dorsey AE. Melioidosis in Malaysia III. Antibodies to Pseudomonas pseudomallei in the human population. Am J Trop Med Hyg 1969;18:703–707. Kanaphun P, Thirawattanasuk N, Suputtamongkol Y, et al. Serology and carriage of Pseudomonas pseudomallei: a prospective study in 1000 hospitalized children in northeast Thailand. J Infect Dis 1993;167:230–233. Kunakorn M, Jayanetra P, Tanphaichitra D. Man-to-man transmission of melioidosis. Lancet 1991;337:1290–1291. Desmarchelier PM, Dance DA, Chaowagul W, Suputtamongkol Y, White NJ, Pitt TL. Relationships among Pseudomonas pseudomallei isolates from patients with recurrent melioidosis. J Clin Microbiol 1993;31:1592–1596. Haase A, Melder A, Smith Vaughan H, Kemp D, Currie B. RAPD analysis of isolates of Burkholderia pseudomallei from patients with recurrent melioidosis. Epidemiol Infect 1995;115:115–121. Bovornkitti S, Leelarasamee A, Thamlikitkul V. Melioidosis. Arch Monaldi 1985;40:203–210. Sookpranee M, Lumbiganon P, Boonma P.. Nosocomial contamination of Pseudomonas pseudomallei in the patients at Srinagarind Hospital, In:. MelioidosisPunyagupta S Sirisanthana T Stapatayavong B editors. Bangkok, Bangkok Medical Publisher 1989; pp. 204–210. Read KM, Currie B, McDonald P, Gordon DL. Reactivity of latent melioidosis in association with staphylococcal endocarditis. Intern Med J 2001;31:130–131. Wise R. Bioterrorism: thinking the unthinkable. Lancet 1998;351:1378. Dharakul T, Songsivilai S. The many facets of melioidosis. Trends Microbiol 1999;7:138–140. Woods DE, DeShazer D, Moore RA, et al. Current studies on the pathogenesis of melioidosis. Microbes Infect 1999;1:157–162. Brett PJ, Woods DE. Pathogenesis of and immunity to melioidosis. Acta Trop 2000;74:201–210. Reckseidler SL, DeShazer D, Sokol PA, Woods DE. Detection of bacterial virulence genes by subtractive hybridization: identification of capsular polysaccharide of Burkholderia pseudomallei as a major virulence determinant. Infect Immun 2001;69:34–44. Woods DE. The use of animal infection models to study the pathogenesis of melioidosis and glanders. Trends Microbiol 2002;11:483–484. Miller WR, Pannell L, Cravitz L, Tanner WA, Rosenbury T. Studies on certain biological characteristics of Malleomyces mallei and Malleomyces pseudomallei. II. Virulence and infectivity for animals. J Bacteriol 1948;55:127–135. Haase A, Janzen J, Barrett S, Currie B. Toxin production by Burkholderia pseudomallei strains and correlation with severity of melioidosis. J Med Microbiol 1997;46:557–563. Ulett GC, Currie BJ, Clair TW, et al. Burkholderia pseudomallei virulence: definition, stability and association with clonality. Microbes Infect 2001;3:621–631. Currie BJ, Mayo M, Anstey NM, Donohoe P, Haase A, Kemp DJ. A cluster of melioidosis cases from an endemic region is clonal and is linked to the water supply using molecular typing of Burkholderia pseudomallei isolates. AmJ Trop Med Hyg 2001;65:177–179. Nuntayanuwat S, Dharakul T, Chaowagul W, Songsivilai S. Polymorphism in the promoter region of tumor necrosis factor-alpha gene is associated with severe meliodosis. HumImmunol 1999;60:979–983. Santanirand P, Harley VS, Dance DA, Drasar BS, Bancroft GJ. Obligatory role of gamma interferon for host survival in a murine model of infection with Burkholderia pseudomallei. Infect Immun 1999;67:3593–3600. Suputtamongkol Y, Chaowagul W, Chetchotisakd P, et al. Risk factors for melioidosis and bacteremic melioidosis. ClinInfect Dis 1999;29:408–413. Rode JW, Webling DD. Melioidosis in the Northern Territory of Australia. Med J Aust 1981;1:181–184. Dance DA, Davis TM, Wattanagoon Y, et al. Acute suppurative parotitis caused by Pseudomonas pseudomallei in children. J Infect Dis 1989;159:654–660. Lumbiganon P, Viengnondha S. Clinical manifestations of melioidosis in children. Pediatr Infect Dis J 1995;14:136–140. Edmond K, Currie B, Brewster D, Kilburn C. Pediatric melioidosis in tropical Australia. Pediatr Infect Dis J 1998;17:77–80. Edmond K, Bauert P, Currie B. Paediatric melioidosis in the Northern Territory of Australia: An expanding clinical spectrum. J Paediatr Child Health 2001;37:337–341. Seiler P, Aichele P, Raupach B, Odermatt B, Steinhoff U, Kaufmann SH. Rapid neutrophil response controls fast-replicating intracellular bacteria but not slow-replicating Mycobacterium tuberculosis. J Infect Dis 2000;181:671–680. Tarlow MJ, Lloyd J. Melioidosis and chronic granulomatous disease. Proc R Soc Med 1971;64:19–20. Stephens DP, Fisher DA, Currie BJ. An audit of the use of granulocyte colony-stimulating factor in septic shock. Intern Med J 2002;32:143–148. Simpson AJ, Suputtamongkol Y, Smith MD, et al. Comparison of imipenem and ceftazidime as therapy for severe melioidosis. Clin Infect Dis 1999;29:381–387. Bateson EM, Webling DD. 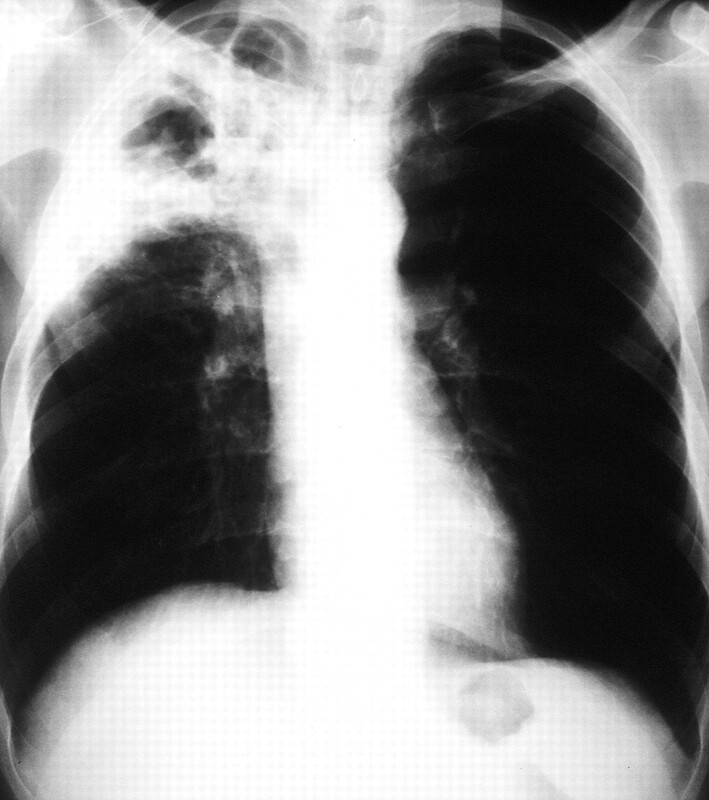 The radiological appearances of pulmonary melioidosis: a report on twenty-three cases. Australas Radiol 1981;25:239–245. Dhiensiri T, Puapairoj S, Susaengrat W. Pulmonary melioidosis: clinical-radiologic correlation in 183 cases in northeastern Thailand. Radiology 1988;166:711–715. Ip M, Osterberg LG, Chau PY, Raffin TA. Pulmonary melioidosis. Chest 1995;108:1420–1424. Everett ED, Nelson RA. Pulmonary melioidosis. Observations in thirty-nine cases. Am Rev Respir Dis 1975;112:331–340. Singcharoen T. CT findings in melioidosis. Australas Radiol 1989;33:376–378. LiPuma JJ. Burkholderia cepacia. Management issues and new insights. Clin Chest Med 1998;19:473–486. Holland DJ, Wesley A, Drinkovic D, Currie BJ. Cystic fibrosis and Burkholderia pseudomallei: An emerging problem?. Clin Infect Dis 2002;35:e138–e140. Ashdown LR. An improved screening technique for isolation of Pseudomonas pseudomallei from clinical specimens. Pathology 1979;11:293–297. Dance DA, Wuthiekanun V, Naigowit P, White NJ. Identification of Pseudomonas pseudomallei in clinical practice: use of simple screening tests and API 20NE. J Clin Pathol 1989;42:645–648. Steinmetz I, Reganzerowski A, Brenneke B, Haussler S, Simpson A, White NJ. Rapid identification of Burkholderia pseudomallei by latex agglutination based on an exopolysaccharide-specific monoclonal antibody. J Clin Microbiol 1999;37:225–228. Lowe P, Engler C, Norton R. Comparison of automated and nonautomated systems for identification of Burkholderia pseudomallei. J Clin Microbiol 2002;40:4625–4627. Zysk G, Splettstosser WD, Neubauer H. A review on melioidosis with special respect on molecular and immunological diagnostic techniques. Clin Lab 2000;46:119–130. Sirisinha S, Anuntagool N, Dharakul T, et al. Recent developments in laboratory diagnosis of melioidosis. Acta Trop 2000;74:235–245. Eickhoff TC, Bennett JV, Hayes PS, Feeley J. Pseudomonas pseudomallei: susceptibility to chemotherapeutic agents. J Infect Dis 1970;121:95–102. Chaowagul W. Recent advances in the treatment of severe melioidosis. Acta Trop 2000;74:133–137. White NJ, Dance DA, Chaowagul W, Wattanagoon Y, Wuthiekanun V, Pitakwatchara N. Halving of mortality of severe melioidosis by ceftazidime. Lancet 1989;2:697–701. Chau PY, Ng WS, Leung YK, Lolekha S. In vitro susceptibility of strains of Pseudomonas pseudomallei isolated in Thailand and Hong Kong to some newer beta-lactam antibiotics and quinolone derivatives. J Infect Dis 1986;153:167–170. Cheong YM, Joseph PG, Koay AS. In-vitro susceptibility of Pseudomonas pseudomallei isolated in Malaysia to some new cephalosporins and a quinolone. Southeast Asian J Trop Med Public Health 1987;18:94–96. Ashdown LR. In vitro activities of the newer β‐lactam and quinolone antimicrobial agents against Pseudomonas pseudomallei. Antimicrob Agents Chemother 1988;32:1435–1436. McEniry DW, Gillespie SH, Felmingham D. Susceptibility of Pseudomonas pseudomallei to new beta-lactam and aminoglycoside antibiotics. J Antimicrob Chemother 1988;21:171–175. Dance DA, Wuthiekanun V, Chaowagul W, White NJ. The antimicrobial susceptibility of Pseudomonas pseudomallei. Emergence of resistance in vitro and during treatment. J Antimicrob Chemother 1989;24:295–309. Yamamoto T, Naigowit P, Dejsirilert S, et al. In vitro susceptibilities of Pseudomonas pseudomallei to 27 antimicrobial agents. Antimicrob Agents Chemother 1990;34:2027–2029. Smith MD, Wuthiekanun V, Walsh AL, White NJ. Susceptibility of Pseudomonas pseudomallei to some newer beta-lactam antibiotics and antibiotic combinations using time-kill studies. J Antimicrob Chemother 1994;33:145–149. Sookpranee M, Boonma P, Susaengrat W, Bhuripanyo K, Punyagupta S. Multicenter prospective randomized trial comparing ceftazidime plus co-trimoxazole with chloramphenicol plus doxycycline and co-trimoxazole for treatment of severe melioidosis. Antimicrob Agents Chemother 1992;36:158–162. Smith MD, Wuthiekanun V, Walsh AL, White NJ. In-vitro activity of carbapenem antibiotics against beta-lactam susceptible and resistant strains of Burkholderia pseudomallei. J Antimicrob Chemother 1996;37:611–615. Writing Group. Melioidosis, In:. Therapeutic Guidelines: AntibioticNorth Melbourne, Therapeutic Guidelines Ltd, 2000; p. 193. Walsh AL, Smith MD, Wuthiekanun V, White NJ. Postantibiotic effects and Burkholderia (Pseudomonas) pseudomallei: an evaluation of current treatment. Antimicrob Agents Chemother 1995;39:2356–2358. Chaowagul W, Suputtamongkol Y, Dance DA, Rajchanuvong A, Pattara-arechachai J, White NJ. Relapse in melioidosis: incidence and risk factors. J Infect Dis 1993;168:1181–1185. Mohandas S, Puthucheary S, Pang T. Relapsing infection due to Burkholderia pseudomallei detected by pulsed-field gel electrophoresis of sequential clinical isolates. Asian Pac J Mol Biol 1995;3:224–229. Chaowagul W, Simpson AJ, Suputtamongkol Y, Smith MD, Angus BJ, White NJ. A comparison of chloramphenicol, trimethoprim-sulfamethoxazole, and doxycycline with doxycycline alone as maintenance therapy for melioidosis. Clin Infect Dis 1999;29:375–380. Jenney AW, Lum G, Fisher DA, Currie BJ. Antibiotic susceptibility of Burkholderia pseudomallei from tropical northern Australia and implications for therapy of melioidosis. Int J Antimicrob Agents 2001;17:109–113.